Kampung Boy by Lat. First Second Publisher. Copy borrowed from a friend. Graphic Novel. The Plot: The story of a boy growing up on a Kampung in Malaysia. It ends, as all good books about childhood end, with the main character, Mat, going away to school. There are also hints that the family may leave the Kampung for the city; that his boyhood home is truly an Eden that will vanish away forever. But Mat, with the innocence of childhood, an innocence he doesn't know he has, doesn't realize it. Recommended for all ages. It's going on my Best Books of 2006. 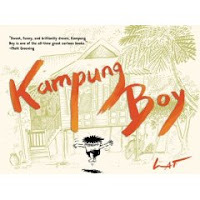 According to Wikipedia, Kampung Boy was originally published in 1979. That's a long time to wait for the US edition. Let's hope there isn't a long wait for the sequel, Town Boy, published in 1981. Links: Publisher's website includes an excerpt. The Wikipedia Entry on Lat.